The UNE Discovery team recently joined in the fun at Minerama, the annual 3-day Fossicking, Gem and Jewellery Festival in Glen Innes, the centre of Australia’s Celtic highlands. It is the largest annual gem and jewellery show in NSW. Held at the Glen Innes Showground for the first time, the event attracted around 3000 people. 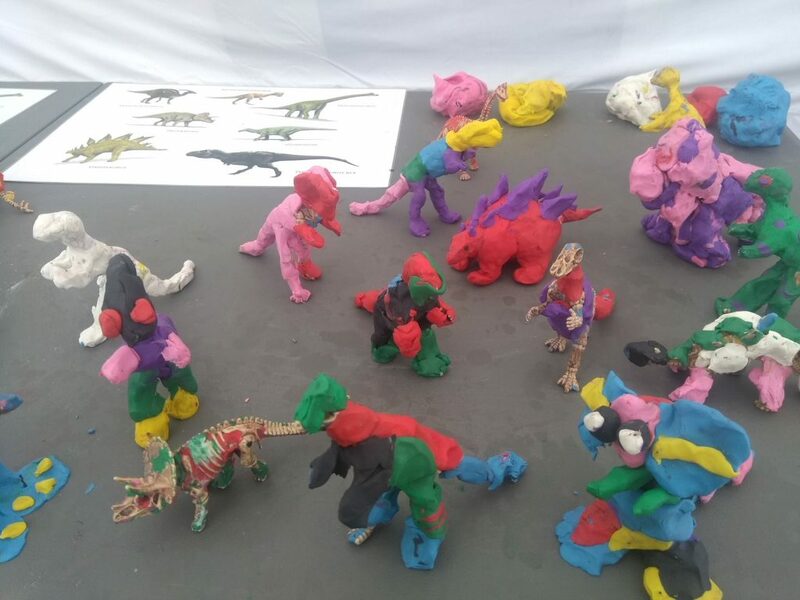 UNE’s involvement included a stall set up where kids and adults could make dinosaur discoveries, join a scavenger hunt, look at many-million-year-old poo, find out some in-depth scientific knowledge, and check out the timescale of the earth. The Discovery team also held student workshops on the Friday, with 110 school children from Glen Innes, Deepwater and Ben Lomond booking into our Palaeontology Puzzles, Science of Soils and Rocking the Age of the Earth activities. We also had some fabulous displays from the UNE Natural History Museum and some of our learned UNE academics were on hand to answer questions, identify pieces and discuss the ins and outs of their fascinating fields. Thanks to the seven UNE Palaeontologists and Geologists who came along to impart their knowledge. Many thanks to everyone who came and looked, played, dug and asked questions. Were you there? Let us know! We’d love to see any photos from the day – maybe you made an interesting find or found out something new!